A national bestseller, A Parchment of Leaves is House's most acclaimed novel, winning several prestigious prizes, including a special citation from the Fellowship of Southern Writers. In prose that often reads more like poetry, Vine Sullivan--a defiant, determined, and beautiful Cherokee woman--tells her deepest secrets and delivers us to the lush and dangerous God's Creek, where she unwittingly becomes part of a tangle love triangle that brings her face to face with death. Often described as a hymn to strong women, A Parchment of Leaves is a mesmerizing look at marriage and forgiveness, and the story of an extraordinary woman. "Breathtaking." --Kirkus Reviews (starred). "Lovely, graceful." --Publisher's Weekly. "Quietly eloquent prose."--Booklist. "Classic literature." --The Birmingham News. "Wonderfully crafted." --Cincinnati Enquirer. "Comelling, lively and suspense-filled." --Winston-Salem Journal. Order. "House knows what’s important and reminds us of the values of family and home, love and loyalty." Clay's Quilt was an immediate success upon its publication in 2001 and is still widely read, being used in many high schools and colleges, as well as book clubs and among readers of all kinds. The contemporary story of Clay Sizemore's journey to living in the present while also holding onto the past, Clay's Quilt is an ode to storytelling, family, homesickness, and a people and place you won't forget anytime soon. "A treasure to be handed down from one reader to another."--Bookpage. "A writer of immense gifts." --Lee Smith. "Deftly written, replete with wisdom." --Publisher's Weekly. "A lovely and accomplished literary debut."--Booklist. "Flawless." --Southern Living. "Perfect." --USA Today. A New York Times Bestseller. Order. Life isn’t easy for twenty-two year old Easter and her teenage sister Anneth, who were left parentless as young children. While Easter, a devout Pentecostal, finds solace in the powerful music of her church, Anneth seeks comfort in the rougher edges of life found in dancing, drinking, and fast living. Easter believes in tradition and is intent on rearing her wild young sister properly, but it’s only a matter of time before a wedge is driven between them–and threatens to undo their bond forever. A reader favorite, The Coal Tattoo joins A Parchment of Leaves and Clay's Quilt, revealing an epic trilogy that can be read individually or as a whole look at an Appalachian family that represents all the best and worst of 20th century America. “[House is] a master. "–The Atlanta Journal-Constitution. “Engrossing . . . [A] pitch-perfect tale.”–Seattle Post-Intelligence. "Deeply moving." --Charlotte News-Observer. Order. The summer of 1976 is a time not unlike our own--America is questioning what exactly it is while soldiers grapple with the afer-effects of an unpopular war. Ten year-old Eli Book is watching as his family seems to unravel before his very eyes. Along with his best friend, Edie, and an unforgettable cast of characters, Eli the Good provides a quintessentially American story about who we are as a nation. In this tender and relentless look at one family, House explores created families, friendships, loyalty, patriotism, and war. A #1 SIBA bestseller, Eli the Good is House's most complex and moving novel yet. "This generation's To Kill A Mockingbird." --Pamela Duncan. "The well-drawn characters and rich setting...make this a memorable story." --Kirkus Reviews. "House writes beautifully." --School Library Journal (starred). "Subtle poetry." --Publisher's Weekly. "Truly remarkable." --Foreword Magazine. "Eli Book will break your heart." --Southern Living. "Important." --Kirkus Reviews. Order. Like an old-fashioned hymn sung in rounds, Something's Rising gives a stirring voice to the lives, culture, and determination of the people fighting the destructive practice of mountaintop removal in the coalfields of central Appalachia. Each person's story, unique and unfiltered, articulates the hardship of living in these majestic mountains amid the daily desecration of the land by the coal industry because of America's insistence on cheap energy. Using magazine-style features and oral histories, the book features people like Jean Ritchie, "the mother of folk," who doesn't let her eighty-six years slow down her fighting spirit; Judy Bonds, a tough-talking coal miner's daughter, and many others. With a moving foreword by Lee Smith and co-written with award-winning author Jason Howard, this is House's only published book of nonfiction. "This revelatory work...is oral history at its best. "- Studs Terkel, Pulitzer Prize winner,"Powerful." --Southern Living. "A landmark."--Courier-Journal. "Important." --Lexington Herald-Leader. "Excellent."--Choice. Order. This is a book of beautiful writing that is, simultaneously, an insightful volume about the art of writing. In the various sections of The Hurting Part, Silas House presents his three-act drama alongside its full literary and developmental context. The book contains not only the full-length script, but also the short story from which the play itself evolved. Also included are a thorough interview in which House desribes his writing process and an analytical essay by the author discussing how the two fictional works originated from one of his family's often-repeated stories. Personal photographs and vignettes about the author, his family, and the play's premiere are woven into the literary and cultural fabric of this book. House outlines solid advice for actors on speaking the Appalachian dialect, with which he has a lifetime of experience. He also describes some of the influences that other playwrights and novelists have injected into his own writing. Even more important, The Hurting Part is extremely valuable for anyone who teaches, studies or appreciates good writing and where it comes from. Order. 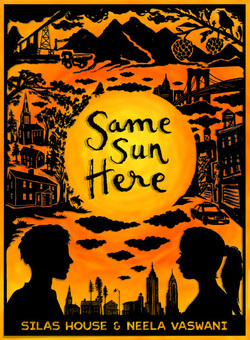 Same Sun Here is one of the most awarded books of 2012. It is also the story of a special friendship between Meena, a 12 year-old Indian immigrant girl living in NYC's Chinatown, and River, a 12 year-old basketball star living in Eastern Kentucky. Meena and River have a lot in common: fathers forced to work away from home to make ends meet, grandmothers who mean the world to them, and faithful dogs. But Meena is an Indian immigrant girl living in New York City's Chinatown, while River is a Kentucky coal miner's son. The unlikely pair become pen pals, sharing thoughts on their lives and, as their friendship deepens, on larger issues such as activism, immigration, racism, and prejudice. Meena's family studies for citizenship exams, faces harassment by a landlord, and experiences the death of Meena s grandmother in India, while River's town faces devastating mountaintop removal, propelling him into a protest march that will lead to him becoming a national celebrity. This glimpse into the lives of two very different youths who find common ground in their everyday lives makes bold statements about cultural misconceptions, the power and powerlessness of the individual and community, and the great value of being and having a friend. Order. The Silas House Page at Indiebound.org, where you can order all of Silas's books from the independent bookseller nearest you.